Cariad talks to writer Thea Lim (An Ocean of Minutes, Soctiabank Giller Prize Nominee) about her Father-in-Law who died of Liver cancer. As ever they talk grief, micro-management + faraway losses. You can follow Thea on twitter @thea_lim and you can buy An Ocean of Minutes in paperback now from all good bookstores. 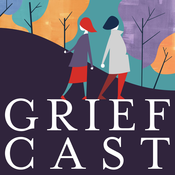 You can follow the Griefcast on twitter and instagram @thegriefcast and you can email thegriefcast@gmail.com Griefcast won Gold&nbsp; (always believe in your soul) &nbsp;in &nbsp;Best Entertainment, Best Interview &nbsp;+ also&nbsp; Podcast of the Year 2018 &nbsp;at the British Podcast Awards and&nbsp; Best Podcas t at the ARIA's. It is hosted by Cariad Lloyd, edited by Kate Holland, recorded at Whistledown Studios and the music is provided by The Glue Ensemble. And remember, you are not alone. Cariad talks to musician and writer Felix White about his Mum, who died of MS when he was seventeen. As ever they talk grief, saying goodbye and Madge from Neighbours. You can follow Felix on twitter @felixwhite and you can listen to his podcast Tailenders from all good podcast shops. You can follow the Griefcast on twitter and instagram @thegriefcast and you can email thegriefcast@gmail.com Griefcast won Gold&nbsp; (always believe in your soul) &nbsp;in &nbsp;Best Entertainment, Best Interview &nbsp;+ also&nbsp; Podcast of the Year 2018 &nbsp;at the British Podcast Awards and&nbsp; Best Podcas t at the ARIA's. It is hosted by Cariad Lloyd, edited by Kate Holland, recorded at Whistledown Studios and the music is provided by The Glue Ensemble. And remember, you are not alone. Cariad talks to writer and copywriter Paul Burke (Father Frank, The Man Who Fell in Love With His Wife) about his Dad and his Mum. As ever they talk grief, London life and Raleigh choppers. You can follow Paul on twitter @paulburkeradio for more information on his work head to . You can follow the Griefcast on twitter and instagram @thegriefcast and you can email thegriefcast@gmail.com Griefcast won Gold&nbsp; (always believe in your soul) &nbsp;in &nbsp;Best Entertainment, Best Interview &nbsp;+ also&nbsp; Podcast of the Year 2018 &nbsp;at the British Podcast Awards and&nbsp; Best Podcas t at the ARIA's. It is hosted by Cariad Lloyd, edited by Kate Holland, recorded at Whistledown Studios and the music is provided by The Glue Ensemble. And remember, you are not alone. Cariad talks to writer Robyn Hollingworth (My Mad Dad) about her Mum, who died of cancer and her Dad, who died of dementia, ten years ago. As ever they talk grief, memory + dancing. You can follow Robyn on twitter @mymaddadstory and her book, My Mad Dad: The Diary of an Unravelling Mind is published by Trapeze. You can follow the Griefcast on twitter and instagram @thegriefcast and you can email thegriefcast@gmail.com Griefcast won Gold&nbsp; (always believe in your soul) &nbsp;in &nbsp;Best Entertainment, Best Interview &nbsp;+ also&nbsp; Podcast of the Year 2018 &nbsp;at the British Podcast Awards and&nbsp; Best Podcas t at the ARIA's. It is hosted by Cariad Lloyd, edited by Kate Holland, recorded at Whistledown Studios and the music is provided by The Glue Ensemble. And remember, you are not alone. Cariad talks to actor and improviser Charlie Russell (Mischief Theatre, The Play that Goes Wrong, A Comedy About a Bank Robbery)&nbsp;about her Mum, who died on her 18th Birthday. As ever they talk grief, mental health and going to the Ball. You can follow Charlie on twitter @CF_Russell or follow on @mischiefcomedy for details of their shows. You can follow the Griefcast on twitter and instagram @thegriefcast and you can email thegriefcast@gmail.com Griefcast won Gold&nbsp; (always believe in your soul) &nbsp;in &nbsp;Best Entertainment, Best Interview &nbsp;+ also&nbsp; Podcast of the Year 2018 &nbsp;at the British Podcast Awards and&nbsp; Best Podcas t at the ARIA's. It is hosted by Cariad Lloyd, edited by Kate Holland, recorded at Whistledown Studios and the music is provided by The Glue Ensemble. And remember, you are not alone.